How do consumer brands stay relevant, authentic and differentiated in a rapidly evolving and culturally complex global market? With 195 countries and 6,500 languages around the world, the challenge is daunting as brands seek new methods and motivators to connect and engage with audiences in social media, experiential and advertising channels. So where do brands need to start in order to begin reaching a better understanding of their customers? And how could deeper understanding impact how and where brands engage? 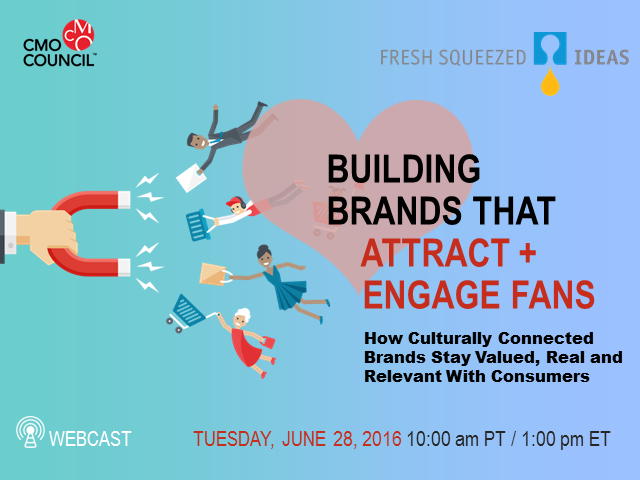 To explore how marketers can create and optimize contextual, authentic engagements with consumers, the Chief Marketing Officer (CMO) Council will be hosting a live webinar, in partnership with Fresh Squeezed Ideas. During this interactive, hour-long session, we will be delving into the key questions that marketers need to be asking as they strive to better connect with and engage audiences across a multitude of channels.